The swim test of individuals participating at an aquatic facility is a key element in both aquatic safety and basic water safety standards. 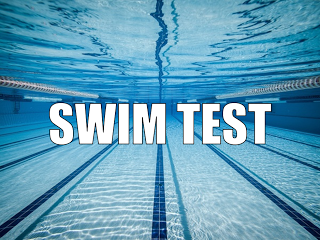 Swim tests should be performed annually to children under the age of 14 years old or 48 inches or less. A swim test is developed to demonstrate a skill level consistent with the circumstances in which a participant will be in the water without a parent or guardian at their side using “touch-supervision” or using proper USCG flotation device (life jacket). A swim test will demonstrate the minimum level of swimming ability for recreation activity in a confined body of water. “Touch-supervision” means that the supervising adult is constantly monitoring the swimmer and within immediate (arm’s length) reach of the swimmer. Watch Around Water is an organization that USA Pools is proud to have partnered with to help promote water safety awareness to reduce drownings or near drownings. A Swim Test is another practice to help promote water safety in and around water. A lifeguard will administer the swim test. Swim tests will be given upon child’s arrival to facility or during safety breaks throughout the day at the lifeguards’ discretion. After the test is given, the lifeguard will record the result from the given test into a database. All staff at the aquatic facility will have access to this information. PASS = Swimmer will have no swimming restrictions while using the aquatic facility. FAIL = Non-swimmer must have a parent/guardian with them in the water using “touch-supervision” at all times. According to the facilities rules & safety equipment, the non-swimmer should also wear an accredited USCG flotation device (life jacket) while at the aquatic facility. Jump feet first into water over the head in depth, level-off and tread water for 60 seconds. USA Pools of Florida has adopted the Swim Test Protocol to promote water safety at all aquatic facilities. The swim test program has five basic objectives. To promote water safety and reduce drownings and near drownings at aquatic facilities. To identify swimmers and non-swimmers at an aquatic facility. To promote and encourage learn to swim classes for self-preservation in children. To conduct a safe aquatic facility program. *Note to Lifeguards: It is very important that you administer this test exactly as stated. Do not make exceptions for any reason. **Note to Aquatic Facilities: You should adopt and allow a Swim Test at your facility as stated above. Failure to do so places lifeguards & children at risk.